I do not often make cakes like this one. Perhaps I should add that it is rather silly because as my grand-mother Marie used to often tell us — when asked about whether she enjoyed her meal — I can say, just like she did, that “ce n’est pas mauvais” (it is not bad). My grand-mother was one of these women who rarely complimented on food. She had not been taught to, and was also shy by nature. In the family, however, we always knew that whenever she responded “ce n’est pas mauvais” to our “c’est bon mémé ?” enquiries (Is it good grandma? ), what she actually meant was that the food was good. Pretty great, as a matter of fact. Despite what you might think, cakes like this one are not difficult to make. But for a minute, I enjoyed imagining that I transformed myself into a pâtissière, which I am really not. Because you see, I do not think that I have many pâtissière skills: I would know it by now. The well-needed qualities in the name of patience and precision not being particularly my cup of tea, I knew very early in age that becoming a pâtissière would be out of the question. As a kid, I always wanted to be an air-hostess anyway! It is good to see that we can change our minds! Since I never hid from you how much I love chocolate, will you be surprised if I tell you that, when David announced the theme chosen for the Sugar High Friday Theme this month, he le pâtissier-chocolatier-humoriste américain à Paris became my star. Ok, only for one day, or as long as the cake I decided to make lasted. His theme was the word with eight bright letters: C.H.O.C.O.L.A.T. Did I say it right? I would need to say it once more: chocolat, more particularly Chocolate by Brand. What chocolate brand do I use when I bake? I will not provide a list of hundreds of names. In fact, I am one of these people that like to stick to something when it works well. How did it happen that I solely started to bake with Valrhona Chocolate is purely a piece of luck, or chance. Le hasard. While you all know that I live in the US, you might not all know that finding good quality baking chocolate can be more challenging here. There are not chocolatiers to be found in every town and city. They exist, Dieu merci, but they are just harder to find. Valrhona worked for me when, many years ago, I first bought a piece from places like WholeFoods or Formaggio — and since I do not fancy paying the high shipping cost from NYC to Boston, from chocolatiers like Maison du Chocolat for example, I stick to what is easily accessible to me. I am lucky too, Valrhona makes excellent chocolate. It did not take me long to decide what I was going to make. I had wanted to improvise a cake of that type for quite a while now. 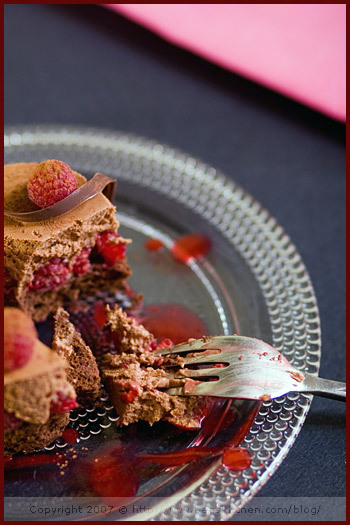 As a true lover of raspberries and chocolate together, I imagined layers that would complement each other. 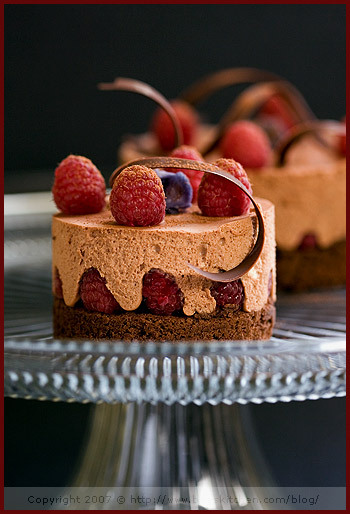 The cake starts with a génoise-type dark chocolate basis which is simply topped with a layer of fresh raspberries lost in a chocolate mousse which I lightly flavored with freshly grated ginger. To dress it slightly more I finished with more raspberries on top, and chocolate twirls — and how much fun I had to make these. Eh bien voilà. Nothing else to say. I said it all. 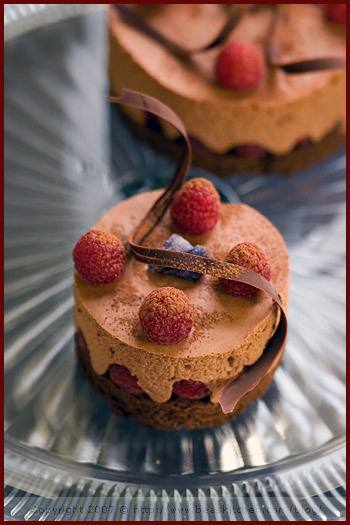 The introduction was made to my Dark Chocolate and Raspberry Cake, with its Chocolate-Ginger Mousse. Now I can sit and relax, waiting impatiently to discover the many more chocolate treats that this event will bring to us. Can we do chocolate every month please, pretty please? Note: For 6 individual cakes, simply double all the quantities in the recipe. Mix 5 1/4 oz fresh raspberries (or frozen) with 2 tsp lemon juice and 1.5 oz confectioner’s sugar. Place in a fine sieve to remove the seeds. To make the chocolate cake serving as a basis, start by melting the chocolate in a double-boiler. Beat the egg yolks with the sugar until white in color, then add the cocoa and cornstarch. Mix well before adding the melted chocolate. Whip the egg whites firm with a pinch of salt and add them delicately to the chocolate batter. Pour in a mold covered with a sheet of parchment paper and cook in a preheated at 350 F oven for 15 mns. When cooked, let rest and cool down on a rack. Take mold rings and cut chocolate cake rounds serving as the basis. Line the ring molds with cake strips. Place them on a baking sheet and add a chocolate cake basis in each mold. Arrange fresh raspberries on top, pointing up. To make the chocolate-ginger mousse, start with heating the milk with the finely grated ginger. Add the confectioner’s sugar and mix well. Keep warm. Soak the gelatin in cold water for a few min and squeeze out the excess water. Add it to the milk and mix to dissolve. Pour the hot flavored milk into the chocolate, in 2 to 3 times, mixing well at each time. Whip the cold heavy cream firm. Fold it gently into the chocolate batter. Pour this mousse on top of the raspberries in each mold. Place in the fridge for 1 to 2 hours, or until the mousses are set. When you are ready to serve, remove the ring molds carefully, then the cake strips. Decorate with fresh raspberries and chocolate twirls. Sprinkle bitter cocoa on top and serve with the raspberry sauce. Note: the cakes can be prepared one day ahead of time. Remarque: pour 6 petits gâteaux individuels, simplement doublez toutes les proportions. Mixez 150 g de framboises fraîches avec 2 càs de jus de citron et 40 g de sucre glace. Passez au chinois pour rétirer les pépins. Pour faire le gâteau au chocolat de base, commencez par faire fondre le chocolat au bain-marie. Séparez les jaunes des blancs d’oeuf. Battez les jaunes avec le sucre jusqu’à ce que le mélange blanchisse, puis ajoutez le cacao et la maizena. Mélangez bien puis ajoutez le chocolat fondu. Battez les blancs en neige ferme et ajoutez-les à la préparation précédente. Versez dans un moule recouvert de papier sulfurisé et enfournez au four préchauffé à 180 C pendant 15 mns. Sortez et laissez refroidir sur une grille. Prenez vos cercles et découpez les bases de vos gâteaux de la taille des cercles. Chemisez vos cercles avec des feuilles de rhodoïd. Placez-les sur une plaque et dans chaque cercle, placez une base de gâteau. Disposez les framboises par dessus, pointe vers le haut. Pour réaliser la mousse au chocolat au gingembre, commencez par chauffer le lait avec le gingembre finement râpé. Ajoutez le sucre glace et mélangez bien. Gardez au chaud. Faites tremper la gélatine dans de l’eau froide pendant quelques minutes, essorez-la et mettez-la dans le lait pour la dissoudre. Versez le lait chaud dans le chocolat fondu, sous forme de petit filet d’abord, puis en 1 à 2 fois, en mélangeant bien avec une maryse à chaque fois. Montez la crème liquide froide en chantilly. Mélangez-la délicatement au mélange précédent. Versez cette mousse sur les framboises et placez au frigidaire pendant 1 à 2 heures, jusqu’à ce que les mousses prennent. Au moment de servir, retirez les feuilles de rhodoïd, décorez de framboises et de décor en chocolat. Saupoudrez de cacao amer et servez avec le coulis de framboises. Remarque : ce gâteau peut être préparé un jour à l’avance. Oh, Bea, this is stunning! What a beautiful creation! C’est vraiment d’un chic absolu! Et j’imagine que ça doit être vraiment délicieux. olala c’est sublimmmmmmmmmmmme et très tentant BRAVO! What is a gelatin sheet? Is it something typical US grocery stores carry? Forgive my ignorance on this subject, but I hardly ever cook with gelatin and have never made a mousse before (I think this gives me the perfect opportunity to try!). Also, since I don’t have and can’t afford metal molds right now, do you think this would work in ceramic ramekins (perhaps assembled upside-down so they can be easily inverted)? And what do you use to make the chocolate twirls? Mine always break, but yours are perfect! I’ve been wanting to make a fancy pâtissière-style dessert for a while now, and I love the chocolate-raspberry combination as well, so you’ve inspired me. Bea, the candy/chocolate shop in Boston’s North End, on Salem Street (I cannot remember the name of the shop), has a wonderful selection of chocolate for baking! Oh. Oh my. My desk is wet from all my slobber. Comme pourrait-on ne pas être pris de faiblesse devant une telle merveille !!! this…..looks….SPECTACULAR! I’ll be glad to forgo dinner and just have the dessert. BTW, what’s the best way to make those lovely chocolate twirls? Ta dernière photo est cruellement appétissant et pourtant je ne suis pas fan de chocolat ! C’est vachemont fabulouse, Béa. Felicitations sur les gâteaux magnifiques…(J’éspere mon français est pas trop mal..) J’adore votre recette…merci beaucoup ma chérie! Je peux gouter le gateau et les framboises, Bea. La photographe est belle! Wow!Wow!Wow! That’s it, nothing else to say but…WOW! Pingback: Chocolate » Blog Archive » (Chocolate candy) This will not only make them that much m…. Wahouuu! C’est superbe! Un délice aussi bien pour les yeux que pour le palais! 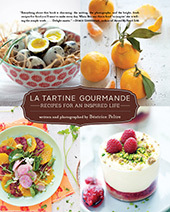 Tu es une vrai artiste, sur tout les plans : culinaire et photographique, je t’admire beaucoup et je copie ta recette trop succombante. Bravo!!! De l’art gourmand, bravo ! Also, I finally got around to making the rice pudding you posted the other day – thank you! It was _delicious_. Pingback: Cocoa Cook » Blog Archive » (Chocolate truffles) There are molds for preparing chocolates…. Beautiful!! Your photos are amazing! Du très grand art, je fonds littéralement ! I love the layers and the especially the curl! Beautiful! Ah ben oui !!! chocolat c’est déjà mmmm, mais avec des framboises des mûres… c’est mmmmmmm amazing !! Wow, I don’t know what to say. What a great cake. I read “about bea”, I figured that you are doing freelancer work -writing, styling, photographing. Just out of curiosity as a reader, are you professionally trained for all those? Because you are truly talented for all those. these little cake are so amazing! What a beautiful creation. Very, very nice job! Exceptionnel , j’adore ! bravo ! la photo est renversante de réalité ! You not a pâtissière?! But your little cake is perfect! Really beautiful Bea…and the ginger chocolate mousse sounds interesting and delicious! Oh my god, c’est vraiment magnifique. Je fonds littéralement d’envie devant une telle merveille ! Béa, vraiment, tu t’es surpassée ! Ce petit gâteau gourmand est digne des meilleurs pâtissiers ! Did you hear that? That’s being falling to the floor! You have floored me Béa! I love this.. j’adore ce plat, this is the most gorgeous creation!! Almost too beautiful to eat! C’est magnifique!! Merci beaucoup!! Ohh what a marvelous chocolate creation this is Béa!! Those chocolate twirls intrigue me as well. I disagree, you are most certainly a pâtissière! This looks amazing. C’est pas toi qui a fait ca…allez avoue, tu as acheté ca chez le plus grand patissier du monde………c’est juste trop beau…ultime………..je reste bouche bée……..my god c’est beau. Un IMMENSE bravo pour autant de talent !!!! Truely beautiful, truely delicious! I like every ingredient you chose. Bea, I agree with you, most chocolate here are not in good quality. I have these great dessert rings and don’t quite know what to use them for. I will definitely try this recipe — or a variation, as my husband is not fond of fruit in chocolate cakes. Thanks so much! And congratulations on stunning photos. this “entremet” has my name all over it! Magnifique! J’aime vraiment cette photo. Dessert au chocolat en plus. J’aimerais améliorer la qualité de mes photos pour mon blog. Que me recommande-tu?? J’attends de tes nouvelles. You are selling yourself short – you definitely have the creativity and skills to be a magnificent patissier! Love your cake! Simply stunning, as always! 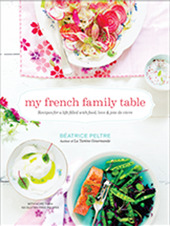 Forget everyone else, I implore you – I need you to create a cookbook that I can buy! You will never make me believe you are not a “patissiere” after this! I am loving the look of it and can only imagine the taste. Great entry! If I ever jump over my fears and drive-me-crazy perfectionism and finally set up shop, I am hiring you to photograph my desserts! Marvelous one, Bea!! I just gotta make this one of these days. Thanks for sharing such great photos and recipe!! I never ceased to be impressed by you. These are gorgeous! And a wonderful flavor combination – I love chocolate, raspberry, and ginger together. Yum. C’est trop beau! Vraiment beau. Et c’est tellement appétissant. I feel very much like you do. When you find the chocolate that you like and that works for you, you keep using it! Your little cakes are so beautiful! And I think you make a brilliant pâtissière! Well, what can I say…even the messy plate photo turned out absolutely perfect through your lens. Enora, merci bien. Contente de savoir que ca te plait! Caroline, gelatin sheets are commonly used in France, and also by pastry chefs here in the US. They are easier and more precise to use than gelatin powder. There are equivalences but can also be very approximate. I know it is not easy to find them here, although you can online. Approximately, a 1/4 oz bag of powdered gelatin, roughly 1 Tbsp = 4 gelatin sheets. If you use ceramic molds, I suggest lining them all the way to the bottom too to make unmolding easier. As to the chocolate twirls, you have to spread some chocolate on a piece of cake strip for example, run lines in it with a fork and fold the cake strip in the shape of a twirl, keep it like this until it dries. Then it is easy to get the twirls when the chocolate hardens. Lydia, oh nice, thanks for the info Lydia! I will have to check it out! I am sure they must have nice Italian ones. Veron, thank you! See the answer I gave to Caroline in the comment above ie the chocolate twirls. Let me know if this is clear enough. David, ah mais oui, c’est parfait! Merci d’avoir organise ce theme. J’adore! LyB, thank you! Glad to hear you have the “wow’ word there! Chantal, merci bien a toi. Sylvie, tu es trop gentille. Cela me touche vraiment! Surtout venant de tes mains de patissiere. Kim, oh nice. I am glad to hear that you enjoyed the rice pudding! Thalie, merci bien. C’est sympa de savoir que tu aimes. Sue, nice of you. I am not trained to do this, you know, but I guess lucky to be able to express my passion for all of these together. This blog is a great place to express it, all in one place. Isabella and Kristen, thank you. Glad you like them. ahah Bron, you are just too funny! Helen, thank you! See the explanation for the chocolate twirls in one of my first response. Loukoum, merci de ton gentil mot. Je suis heureuse de lire que tu aimes revenir! Gattina, thank you! Good to stick to chocolate that works, eh? Astrid, oh nice. I hope you make good use of your molds. I love mine! Fanny, I bet this is a Fanny’s cake 😉 Glad to hear that you also like the new look! Merci! Helene, merci. C’est une question avec plein de reponses. J’imagine que tu dois essayer de jouer avec la lumiere. Peut-etre tu peux me dire ou tu as des problemes et je peux mieux y repondre? Ellie, ah yes. I will definitely keep you posted, a big promise! Danielle, thank you. Glad to hear you like it. Tarzile, merci bien a toi. Connie, yes Valrhona is certainly a great help in the outcome of these cakes. Sha, oh you are such a sweet heart! Thank you very much. I am also so glad to see you back in the blogosphere! Ivonne, thank you my dear! Rasa Malaysia, thanks. Nice note of yours! I’d like to know when you find time to make all these beautiful creations!! that’s also what i want to know bea…how could you have the time to make these elegant perfections? wish i can have a copy of your daily sched bea! Those look like a $12 dessert! You can make such beautiful things with those rings. I saw them at the store the other day. Maybe I’ll try something fanciful like this. I have no patience though and somehow it seems like it would all tumble over once I took the ring off! That looks delish! I’m a big fan of chocolate and just love it when paired or combined with fruits. Great presentation and photography 🙂 This just inspires me to make more chocolatey desserts in the near future – really looking forward to it. I do not know about the actual taste, but it looks tout simplement *Delicieux*! You are a talented cook and petissiere, plus you have a gift for photography! Encore un truc de ouf… mais tu arrives à t’endormir le soir ?!! tout est si beau, si poétique et certainement délicieux, quel talent Béa ! Your cake looks sooooo delicious. I’ve to try your recipe as soon as possible. Sorry – me again. – Thank you for this recipe and for trying successfully to be a pâtissière for that event. Gorgeous as usual, Bea. I love your ribbon of chocolate. You could do a whole post on chocolate ribbons alone. Rachel, I think you would not regret getting ring molds. Alwyn, thanks. I am glad you found inspiration. Lilo, tu es trop gentille, vraiment. 😉 ca me touche. Lucy, this is an excellent idea indeed. this certainly looks yummy! i am going to try it, but getting sweet raspberries in Singapore is a problem. thanks for the information about the recipe of all these yummy stuffs.. it certainly will tame my sweet tooth for a while. after i try the recipe i will definately feedback to you. thanks again! WOW!! very tempting object and wonderful captures. i’m sure you’ll win! pourrais-je savoir la hauteur des moules que vous utilisez ? Merci, les moules que j’ai utilises mesurent, en hauteur, 6 cm pour les petits et 8 cm pour le grand. Miam. Et voilà, je n’ai pas résisté et j’ai craqué pour cette recette et naturellement, je ne l’ai pas regretté, c’était très bon, le gingembre bien dosé, la mousse parfaite, la base biscuitée aussi. Merci pour cette recette! Cnt believe i missed such a wonderful post ….better late than never.Your creation looks simply splendid.I have to try it.Thanks for sharing.I’ve added you on my blog so everyone gets see how very talented you are . ooh i go crazy with passion every time i see your website. i cant wait to try this but seriously how do you have the time when you have a job??? do you have a personal shopper who buys all the ingredients? Bea, I made these last night and they were wonderful. Thank you for the recipe and the inspiration. Pingback: lyndon dot biz » Blog Archive » Dinner Party Desert. We have a Winner! Thanks for the recipe … I did it for my b-day and everybody love it so much. One of my friends tell me that was the best cake she tryed in all her live and she is really “gourmet”. So thanks again for your blog…It is the first time I follow a recipe from a blog and was perfect! So, Muchas Gracias!!!!! wouahhh !! je découvre votre blog aujourd’hui, c’est une merveille ! photos magnifiques et des recettes à tomber !! je l’ajoute de suite à mes favoris !! I did try this one (after lots of doubts on myself!) and awaiting verdict this evening. The final product is not as picture-perfect as Bea’s though… i guess that is being greedy:) the cake base was so easy and the mousse needed only little patience. I made it as a 8″ single piece so had to triple the quantity of mousse to make a good size. But but… the mousse covered up the raspberries.. i mean one has to eat to find out there is a layer of fruits over the base. How did you get them so beautifully? And also when i released the cake from the ring some of the mousse came off (i had to smoothen with great difficulty). What is the secret please?Oh,yes and also i used agar-agar instead of gelatine but the texture was good. I’ll repeat this dessert for sure and should try with individual rings to see the effect. Thanks Bea! Je découvre qu’il n’y a pas que des tartines ici !! C’est fantastique ! I am glad you tried the cakes. To make sure the raspberries show, place them tight, close to the outer edges of the plastic liners. Then pipe the mousse in.I have more experience making individual cakes. Last night, I made 6 of them. I doubled the recipe for everything, and it worked great. Hola, soy una principianta y me ha encantado la foto del pastel con frambuesas. Quisiera hacerlo, pero primero voy a intentar traducir del francés al castellano. Si están estas recetas en algún blog pero en mi idioma, os rogaría que me lo indicárais. I’m speechless…et j’ai tellement faaaiiiiim!!! Bravo Bea! Je suis inscrite au concours de Culinate et suis prete a voter pour toi! Thank you very much, Bea, for your kind reply:) I shall remember your tips when the raspberry season starts again…. oh Spring, do come soon…. Stunning! I wish you would enter this in my little “Art You Eat” contest about chocolate this month! I know I will be marking and trying this either way. Reggie, ramekin mould would make unmolding quite challenging. The mousse is still soft and fragile, so if you can, it is best to use ring molds. You can improvise some by cutting cans perhaps?